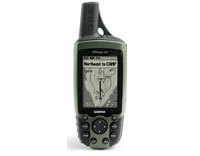 Garmin GPSMAP 60 (010-00322-53) €213.00 - buy online at mysatnav.ie - Ireland's leading GPS & Sat Nav store. The GPSMAP 60 has 24MB of internal memory to hold maps from optional MapSource� software available on DVD. The GPS is compatible with Garmin Bluechart� marine map data, Garmin City Navigator� street-level maps e.g. Ireland, UK, Europe, North America and can also accept freeware contour maps of Ireland from the Scottish Mountaineering Club.